"Road-Peace is a step toward world peace." and donate funds for publication. to their sites, and credits on the published ads. The GRIDLOCKSMITH store is now open. that will be more safe and pleasant. the creation of World Peace. Is the nation's capital ready? A route should have been built 30 years ago. Have you noticed that the word "anger"
is only one letter short of "danger?" 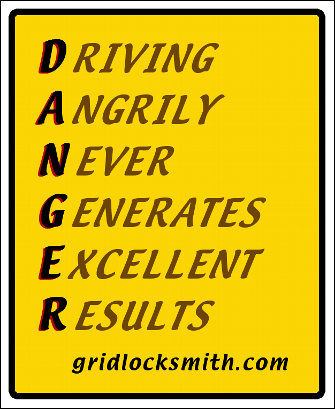 If you are angry while Driving, there's plenty of Danger. 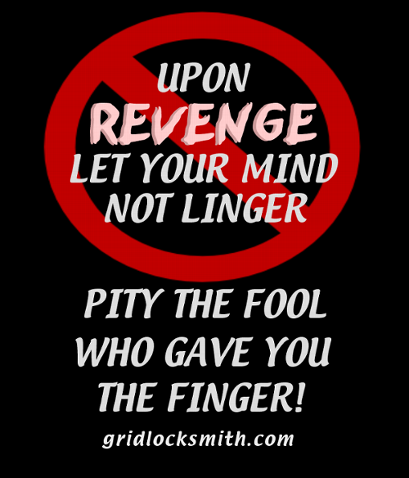 It is not always easy to laugh when others are doing stupid/dangerous things, but we do have the power to decide to forgive and write it off as a mistake, rather than take umbrage and believe the other guy is evil. We benefit greatly by making the choice to relax and laugh. It is better for the heart, the soul, and for everyone on the road. that could endanger ourselves and others. In short, we will be setting a bad example. Then we become part of the problem. Why not join the Roadway Anger Gentle-fication Effort, and be part of the solution? secure in the knowledge that you, at least, are not "part of the problem." Pay attention - do not gawk! And my, how your friends will talk! STOP FUNDING TERRORISTS! END OUR DEPENDENCE ON OIL. HELP POOR NATIONS AROUND THE WORLD BECOME PRODUCTIVE. DEMAND A FLEX FUEL ECONOMY.